View Entertainment Schedule for the Midway. What happens when teenage accordion players aren’t allowed in marching band? They start a polka band. That’s the story of teens Dan O’brien, Dan Sutts, Paul Coates, Mike Lewis, Cody Garret, and Jake Kouwe, who nine years ago launched "The Chardon High School Polka Band." 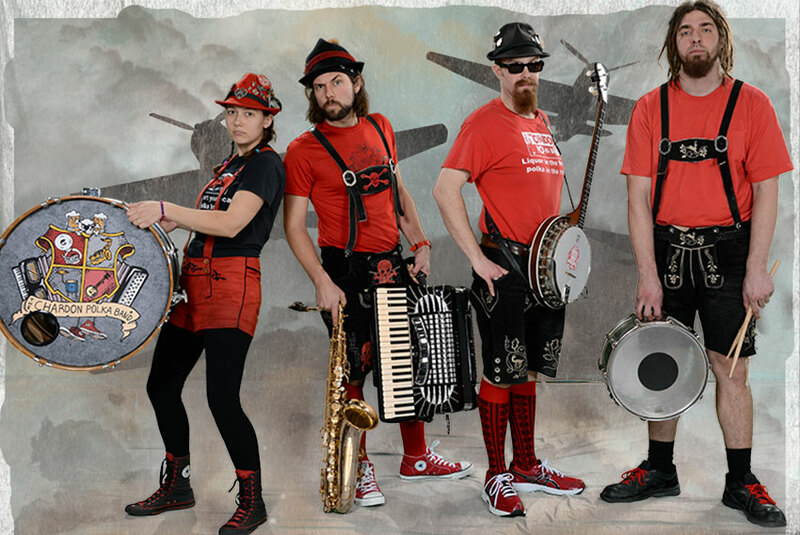 Long hair, torn jeans, chuck taylors, and a blue mohawk may not be what you’d expect from your average polka band, but there was nothing average about these outcasts from Chardon. With their relentless energy, musical skill and off-the-wall sense of humor, they were destined to reinvigorate the genre. Starting humbly, they at first played solely for peers and local nursing home residents. It didn’t take long though for the outcasts to become the in thing, as they were soon playing notable venues and events across northeast Ohio. While there’s been a lot of change in the nine years since their inception, the band’s chief goal remains constant—rocking your socks off with polka music! From their humble beginnings as high schoolers going against the grain, playing polkas instead of punk, the Chardon Polka Band has evolved into one of Northeast Ohio’s most beloved and recognizable acts. And as they continue to redefine and breathe new life into the genre, their popularity just keeps growing. No longer just a local act, they can now be found playing gigs throughout the midwest and up and down the east coast. What’s more, in 2015 they starred in a REELZ TV reality series titled, The Polka Kings. 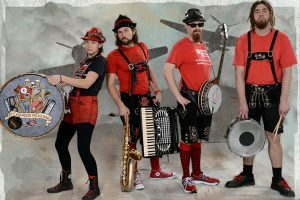 Comprised of members of Deutcher Musik Verein, the Brews Brothers are a fun-loving roving band who can drink, play musik, sing and incite communal revelry all at the same time. For those who find drinking and standing simultaneously a challenge, don’t try this at home without a spotter. The Brews Brothers are professionals. In 1969, with burgeoning men’s and women’s choruses, it became apparent that another chorus was needed in the Columbus German Community: A children’s chorus. Kinderchor means "children’s chorus" and Jugendchor means "youth chorus".It is comprised of children from ages 3 through 18. At its height in 1983 when they toured Germany there were more than 80 children involved. Its key to success has been dedication to the children, allowing them to take responsibility for their chorus: by making plans and seeing them to fruition. Currently under the direction of Toni Ryan, the children’s repertoire is tailored to meet the needs of growing voices and a variety of skill levels. The very youngest learn German nursery rhymes that teach the concepts of opposites, numbers, times and seasons, and parts of the body. The older children learn to sing in rounds and two and three part harmony. At all levels, there is a heavy component of building German vocabulary, good musical practices and performance art. The Columbus Kinder- and Jungendchor perform a number of times throughout the year in the Columbus area. Their uniforms are German Tracht, Dirndls, and Landhaus (or German Country) dresses and Lederhosen (or German pants). The Cleveland Maennerchor has enjoyed a rich history in Cleveland, Ohio. The choir was established in 1967 through the efforts of the Schwaebischer Saengerbund and Heights Maennerchor. The Heights Maennerchor was originally founded in 1873 in the Heights area of the near West Side of Cleveland while the Schwaebischer Saengerbund was first organized in 1885. The Maennerchor is a testament to the large influx of German immigrants to this area which, in turn, served to enrich our culture and diversity. The German people have always loved to sing. The Cleveland Maennerchor strives to promote this German tradition of song in the hope that it will continue to flourish as it has for over a century, here, in Cleveland. The Cleveland Maennerchor meets for rehearsals every Thursday at 8:00 P.M. in its hall. The male singers perform at local events, host numerous ethnic gatherings, perform at regional and national conventions, and also perform at local events throughout the year. The warm atmosphere and authentic German décor of the Maennerchor Hall has attracted several other organizations that hold meetings throughout the year. While the Maennerchor is made up of mostly ethnic Germans, being German or German ancestry is certainly not a criterion for membership in the choir. All that is required is an interest in singing in German. We invite all those who would like to join us in raising our voices in beautiful, joyous German song to come during any rehearsal. Call 216-741-7728 for further information. The Heights Damenchor was founded in May, 1876. This chorus is probably the oldest surviving Women’s German Chorus in the United States. They may, in fact, be the oldest surviving German Chorus. The suburbs were called the Heights and it was decided to name the group the Heights Frauenbund. Sometime later the name was changed to Heights Damenchor. Many of the directors stayed for a long time and were of German descent. In 1945 the chorus met at a new location, the Heights-Maennerchor Halle, and have remained at this location (Cleveland Maennerchor, 4515 State Road). The Heights Damenchor have been active members of the Central Ohio Bezirk and North American Saengerbund by participating in their Saengerfests every 3 years. They are also members of the Deutsches Saengerbund in Germany and received the many awards regarding participation in German Song and Traditions. Many of the members’ families and friends have come from the same area of Germany keeping the traditions and music alive. We celebrated our 125th Anniversary in 2001 with a gala evening of song which included the other German Singer Clubs. New members are welcome and do not have to be German. Our members will teach you the German.